A restful sleep comes for a price. The luxury bedding craze is luring the rich to bed in style. 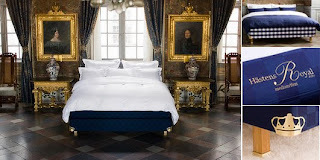 Luxury bed maker Hastens, known for its high-end clientele including Tom Cruise and David Beckham, is now offering a royal treat to its uber rich clientele with “The Royal Bed” to celebrate the marriage of Crown Princess Victoria to Daniel Westling on June 19. The all-natural mattress set, a trademark of Hastens, features bridal colors, “lavish white with subtle accents in sumptuous gold,” and it features legs made in oak and accented with brushed brass. Each bed is embroidered with gold thread that reads: “Hastens Royal 2010″ and each corner of the bed is adorned with a brushed brass crown that is detachable. The royalty comes for a matching price tag of $18,000. The bed will be made in limited quantities and offered for sale only through the end of June through the 10 Hastens stores in the United States. The bed is offered in soft, medium, firm or extra-firm constructions. Really interesting topic and What a beautiful Bed.! I like this bed very much. It is very nice. Surely I will buy. Thanks for sharing. Improving your vision in any sort of weather or at any time of the day is what these passat hids .lights are all about. Here at HIDKit.com, we have amassed a large selection of the latest Passat HID kits on the market just for your car.